Nick Bordin believes that respect and trust are key in any relationship – and real estate is no exception. “I was drawn to real estate because I like meeting people and watching their life journey, and helping them as their property needs change,” Nick says. 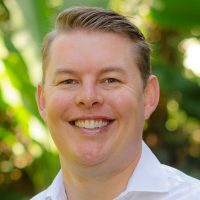 Originally from Kyogle, Nick moved to the coast to pursue a career in real estate when he was just 18 years old, and he quickly built a solid standing in sales at Elders Lennox Head. His career highlights include seven years working in Sydney’s booming Eastern Suburbs. While there, he helped run the number one team nationwide at McGrath and The Agency and was involved in the sale of over $1.5 billion of property. Nick puts this success down to his country upbringing and ethics, which kept him grounded in one of Australia’s most competitive real estate markets. While he’s been involved in numerous record sales, Nick believes that it’s not just about figures – it’s about meeting and exceeding client expectations and making sure everyone’s needs are understood. And it’s his energetic, customer first approach that has helped him build lasting relationships and an impressive reputation. In early 2018, Nick and his wife Hannah returned home to Lennox and they couldn’t imagine a better lifestyle than raising their growing family in the North Coast community. Would you like to speak to Nick? If you’re thinking about renting or selling your property and you’d like a clearer picture of how much your property might be worth or want to have an informal chat about general property market trading conditions, Nick will be happy to arrange a full market appraisal of your property.